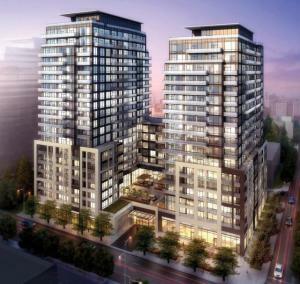 Axiom Condos is a collection of suites that will reflect the intelligence of design for optimal condominium living. It will have many hotel-inspired amenities of this glittering new condominium, in the dynamic urban setting of Downtown Toronto East (located at 460 Adelaide St E). The first phase has already sold out. Developers Greenpark and Fieldgate Homes are scheduled to complete the second phase in the spring of 2017. Axioms Condos is walking distance to all of Toronto’s downtown destinations, with a 98 walk score. It is also steps away from several transit options, with a 100 transit score.